Our latest newsletter highlights how Local Trust is working with an alliance of organisations to call for a new approach to funding communities across England. Meanwhile, as summer comes to a close, Big Locals are sharing their own stories - in song, film, audio and good old-fashioned pen and paper. Don't miss out on the Big Local Leaders Assembly and the opportunity to take part in Creative Civic Change. An alliance of 17 voluntary sector organisations and funders, including Local Trust, has proposed a new Community Wealth Fund to support the communities who need it the most. Why do residents in Big Local areas turn to history to make sense of how people and places are changing? Following Carey Newson's essay, Designs on the Past, our podcast panelists discuss the power of heritage. You still have time to express interest in taking part in this new programme which will help you make positive change in your community using the arts and creativity. Get in touch by Friday 28 September 2018. This event on 28 and 29 September is a brilliant opportunity for every Big Local volunteer to learn and share leadership ideas and approaches and develop skills. Those who come will help shape how we support the development of Big Local leaders. Everybody works better as part of a team. 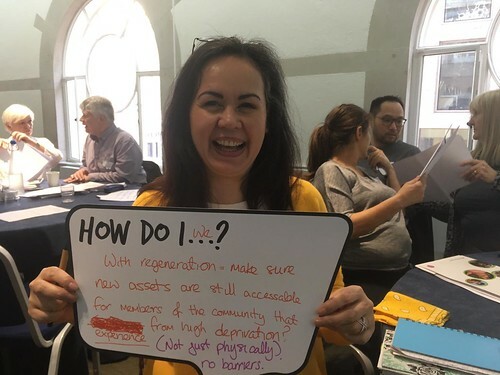 During this one day event we will bring together the people involved in Big Local which includes partnerships members, LTO’s and workers to explore, support and identify the role you all play in delivering Big Local and achieving great things. Join us in Manchester on 14 November. Jacqui Cook, ChART Big Local, shares how within 9 weeks, a mixture of hard graft and carefully chosen volunteers has created a food bank where visitors feel at home and even enjoy themselves. Dan Gregory, author of our proposal for a Community Wealth Fund, shares his thoughts on the government’s new Civil Society Strategy and explains why he feels this was a missed opportunity. Local Trust is joining a group of leading funders who openly share data about the places and projects they support. A chance to see the fantastic stuff Northwood Big Local are doing to enrich and support their community in this lovely film. We wish we could be part of their Group Groove dance and weekly cooking classes! This special film from Scotlands and Bushbury Hill Big Local premiers a new song written and performed by young people as part of a summer programme about the worries and concerns they can have about moving from primary to secondary school. More than 100 Big Local workers have taken time out of their day to complete our survey. Thank you for your feedback. Workers who still wish to have their say have until 14 September.